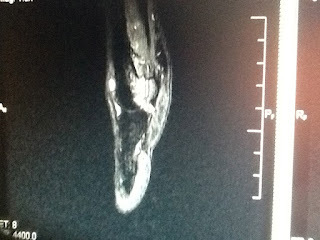 The following series of MRI images closes out my first full year as a blogger. I started in 2010 and still have not found my rhythm of sorts. I am amazed that the blog has hit 150,000 page views. Thank you readers. 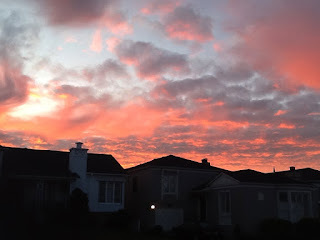 I hope this blog has been helpful to many people and I will continue to work hard on the content in 2012. Happy New Year!! First some fireworks from the Hilton Hawaiian Village in Waikiki. 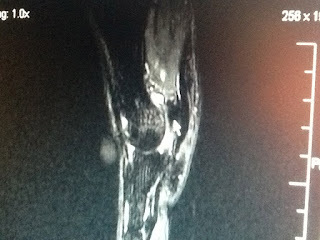 Here the injured tibial sesamoid (aka medial sesamoid) under the first metatarsal shows up white on this T2 image MRI. 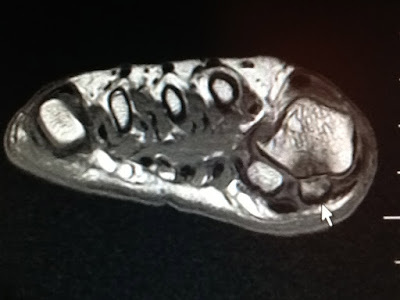 The arrow points to the injured sesamoid on the bottom of the foot at the ball of the foot. The first metatarsal overlying the sesamoid is also inflamed on its weight bearing surface making it difficult to walk. The same injury on the top of the joint can walk more easily. The the top and side of the first metatarsal intense soft tissue swelling is seen making it difficult to bend the joint. Sorry Jen!! On this image, the normal fibular sesamoid (aka lateral sesamoid) shows up dark black. On this T2 imaging, normal bone, tendon, and ligaments are dark black. When they are injured, the normal healing process brings fluid into them and they get white reflecting that fluid. 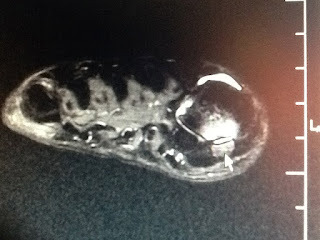 On this image, the bottom of the ball of the foot is sliced. The tibial sesamoid is seen white, and the fibular sesamoid black. 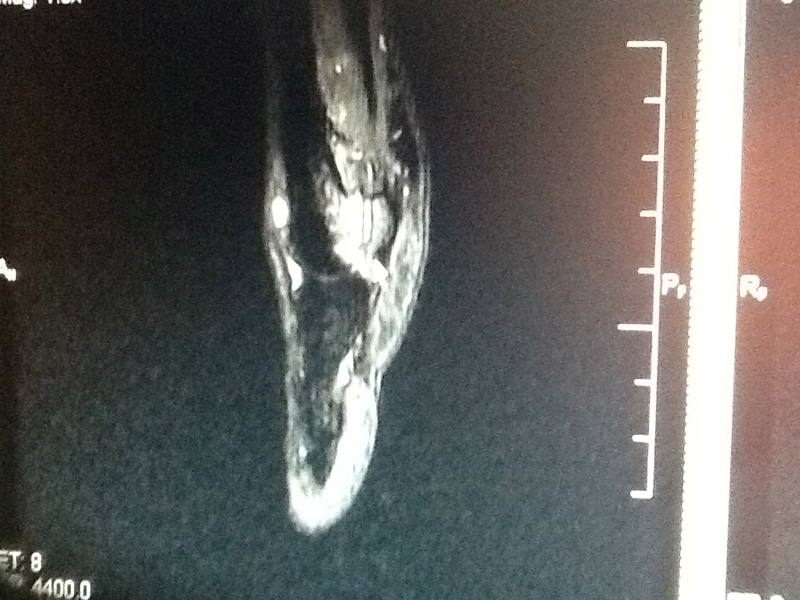 The arrow points to the grayish fracture line running through the sesamoid. 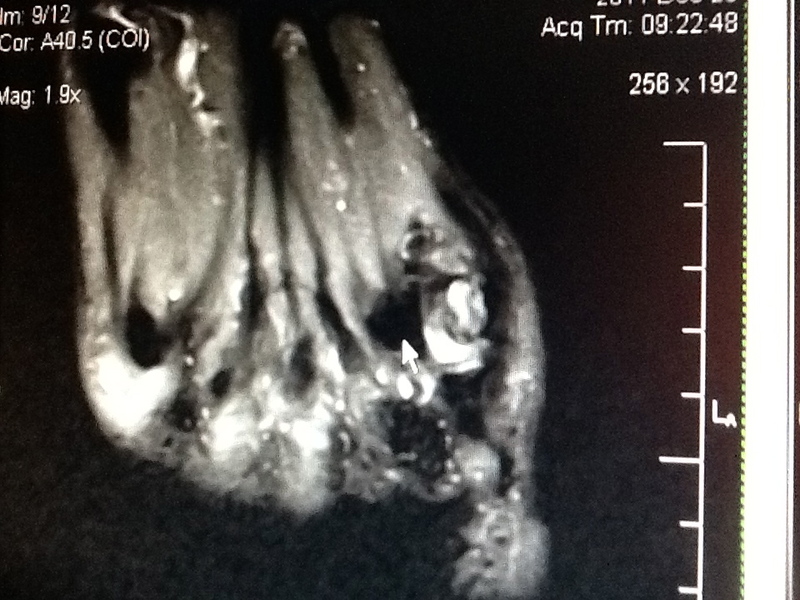 This same image is shown to demonstrate the intense swelling near the fracture, which occurred many months ago. This swelling will be addressed with contrast bathing (see blog post) and icing during the day. Anti-inflammatory medications like Advil or Aleve are contra-indicated since they can slow bone healing. Jen may need a bone stimulator to help heal this bone which is a notorious slow healer. 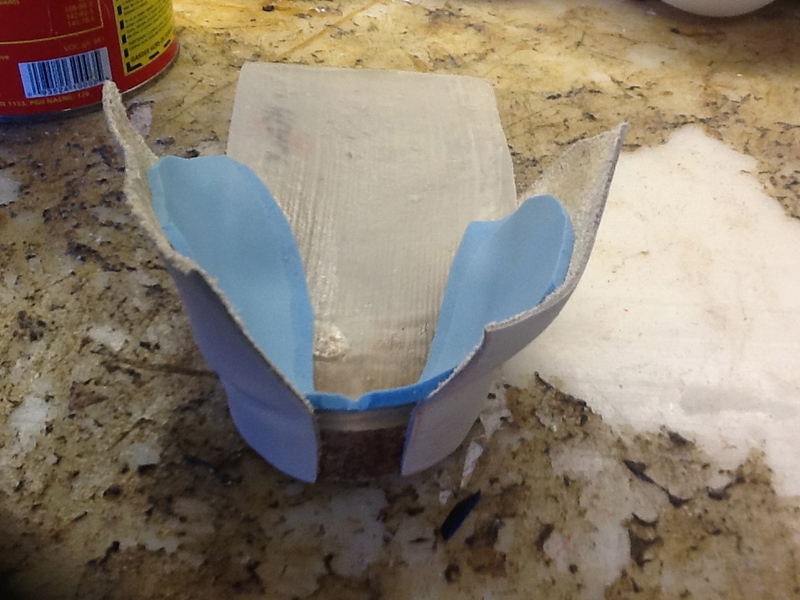 She has been placed in a removable cast with her orthotics to off weight the injured bone. Again the healthy fibular is highlighted by the arrow. Jen is upping her daily Vit D and Calcium. We are going to get a Bone Density Screen and Vit D3 blood levels. She has run low in the past. The injury occurred 6 months after childbirth and perhaps her estrogen levels were off. We need normal Vit D and estrogen to move calcium into bones. Even transient drops in these levels, at a time of increase activity, can produce a stress fracture. 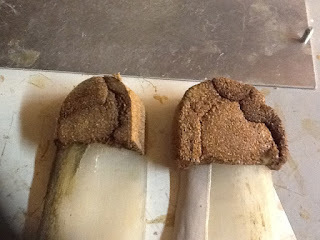 On this section, the top of the foot, especially the top of the big toe joint is sectioned. 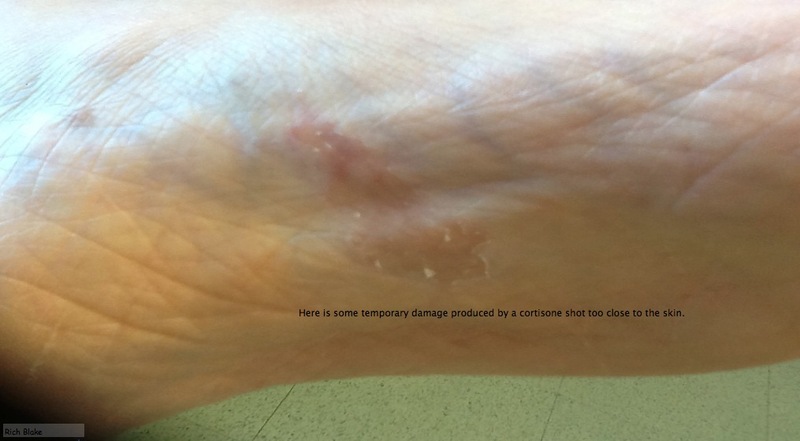 The arrow points to the intense swelling at the top of the joint making it impossible to bend her toe. The initial X-rays taken were negative for fracture, but stress fractures can be a hair line and never show up. 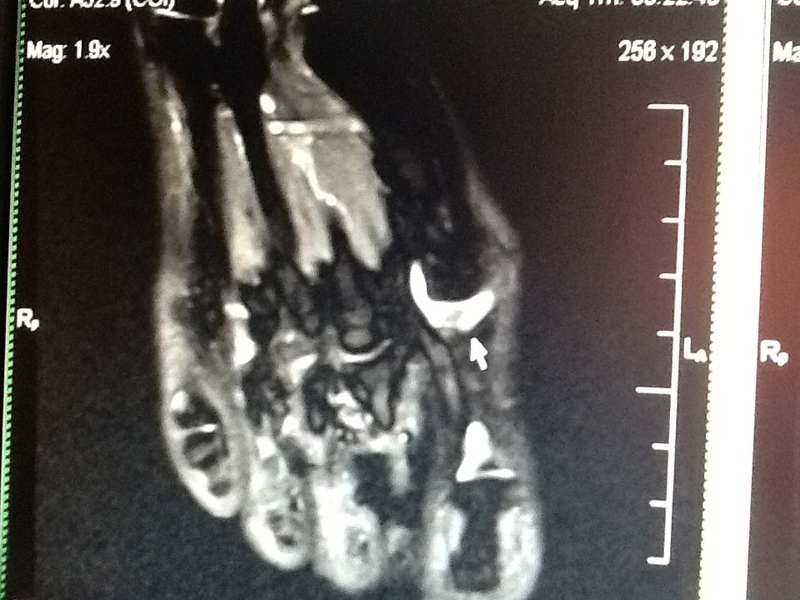 Many patients have X-rays for sesamoid injuries read as negative correctly, but still may have a stress fracture. With sesamoid injuries, you have to treat the worse case scenario, a possible fracture unless an MRI or bone scan proves it is not a fracture. X-rays are not great indicators since the injury can be too subtle to pick up. 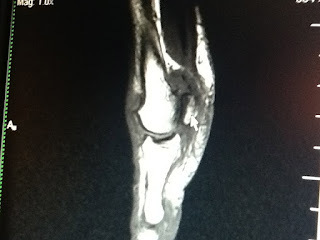 Many stress fracture locations are probably fine if the patient does not know exactly if the bone is fractured or not. 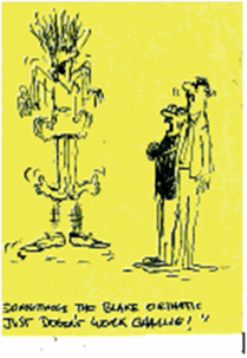 The patient is still treated until the symptoms go away. With sesamoid fractures, when the stress fracture is not picked up, there is a greater chance of surgery down the road. As of right now, I told Jen she has about a 10% chance of surgery 6 to 12 months from now. We will get a new MRI in 3 months to check healing. If improvement is noted, the odds for surgery go now. If no improvement is noted, the odds for surgery go up. 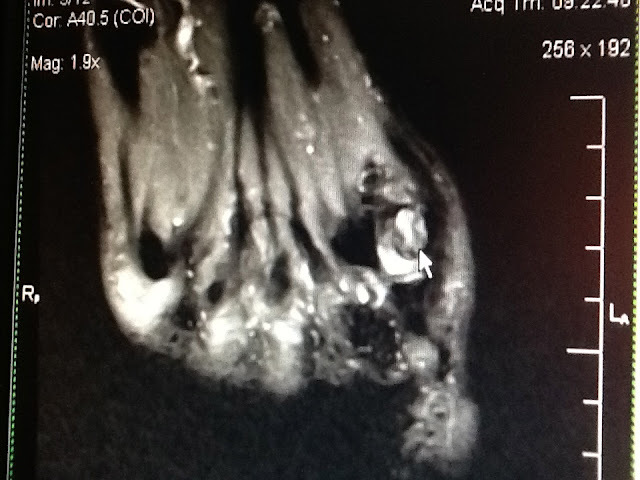 This is a T1 image highlighting normal bone as white. 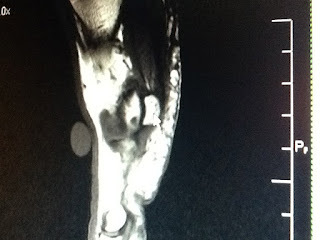 The arrow points to the fracture line in the tibial sesamoid. The fracture is non displaced and has excellent healing potential. I tend to use bone stimulators when there is some displacement of the fracture pieces which could make healing slower or not occur at all. I love Smith and Nephew's Exogen Unit. It is used 20 minutes twice daily. 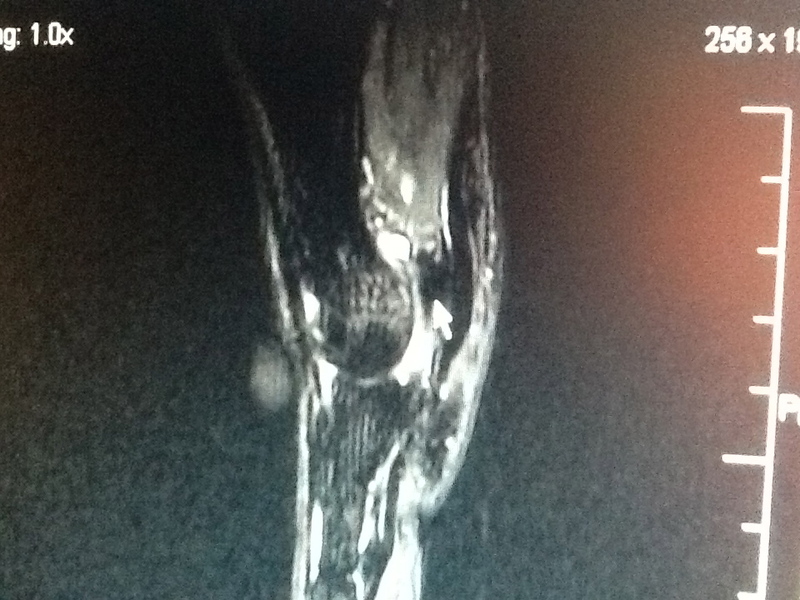 This T1 image shows the tibial (medial) sesamoid surrounded by inflammation. 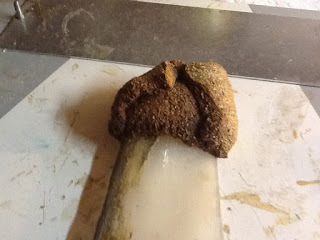 The inflammation is a grayish cloud that can be seen on top of the joint also. The fracture line is seen along with other areas of the bone which are darkened indicating healing is active. Emphasis on healing!! This image shows the normal fibular sesamoid. The difference in the 2 sesamoids is quite distinct visually. This T2 image really shows the healthy top bone, and the inflamed angry mad sore unhappy discontented "difficult to get along with" bottom bone. Sorry the image is on its side. When the bottom (plantar) part of the bone is involved, weight bearing can be difficult and harmful. If I can not get her weight bearing comfortably, but I should if I am worth my salt, she would have to be non weight bearing. The Golden Rule of Foot: You must always create a pain free environment for injuries to heal. Even though levels 0 to 2 pain is still considered good pain, pain is different for different people. Jen has a high pain threshold, so her level 2 may be a 4 or 5 for someone else. I have to be more cautious and protective in a high pain threshold patient, than a low pain threshold patient like myself. 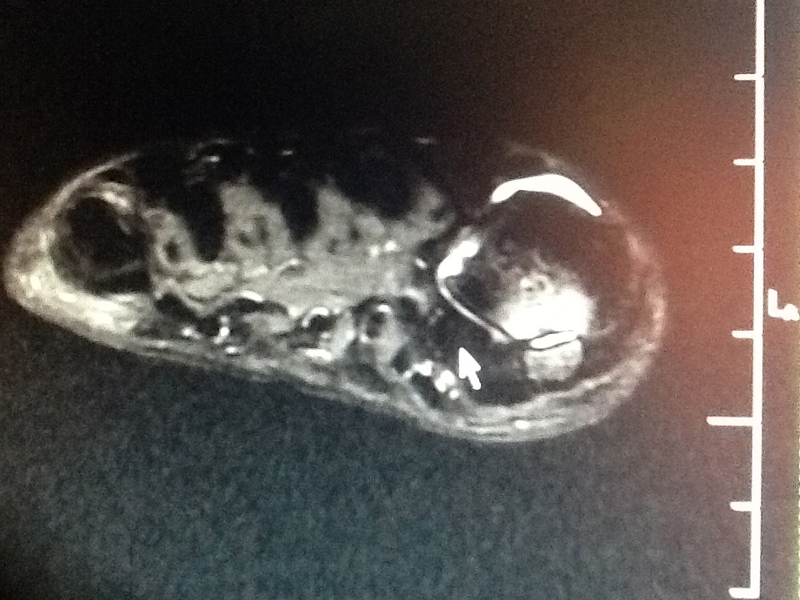 The fibular sesamoid and underlying tendon to the big toe look normal. This image shows the non displaced fracture line in the tibial sesamoid. 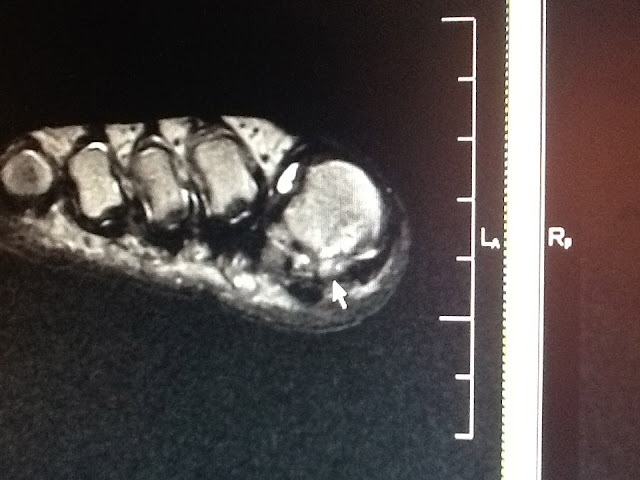 This T1 image shows the inflamed tibial sesamoid, and the inflamed bottom of the first metatarsal. 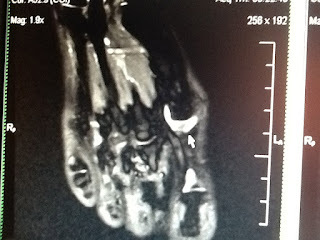 The fibular sesamoid and all of the other metatarsals look very healthy. We can not rule out actual injury to the first metatarsal also, so I will be talking to Jen about getting a CT Scan in the New Year (less than 6 hours at the time of this typing). The CT Scan will only show bone and show me if there is anything more happening than just (poor choice of words) a sesamoid injury. 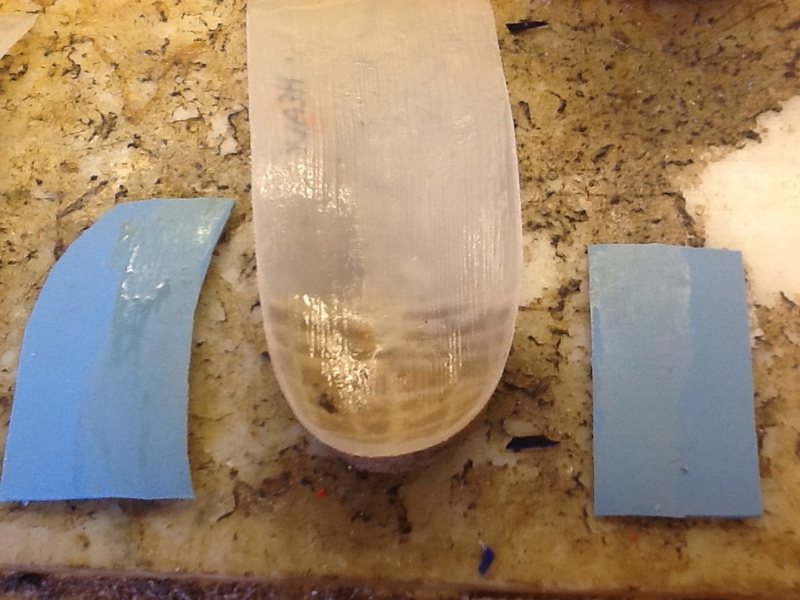 The following photos demonstrate the application of an extrinsic rear foot post. For many custom made orthotics, they are a vital component. For many Over The Counter devices like Superfeet, they can be added for greater stability. 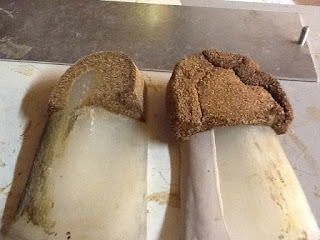 The Birkocork material is the same material used in Birkenstock sandals. It is heat moldable, and easily sanded. 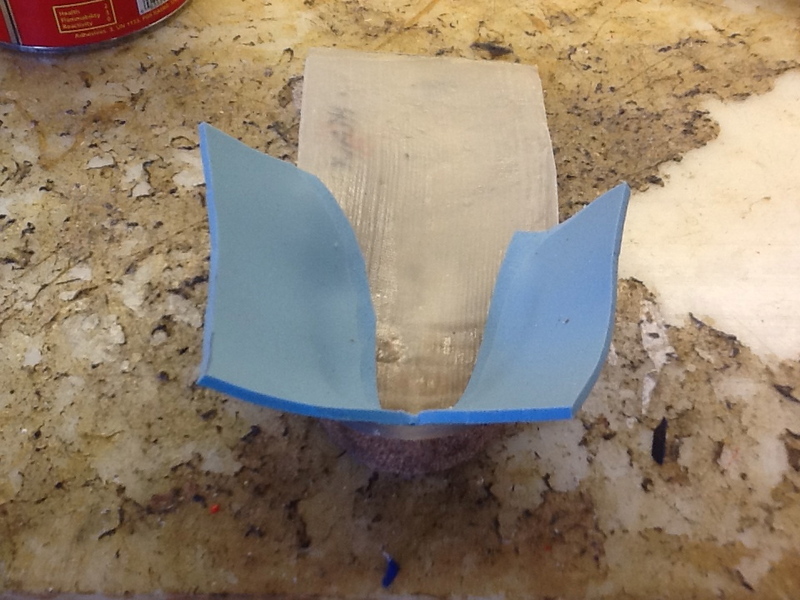 The material I purchase from JMS Plastics in New Jersey is bought 10mm thickness hard. It is heated in a convention oven at 475 deg F for 5 plus minutes until browning on top. 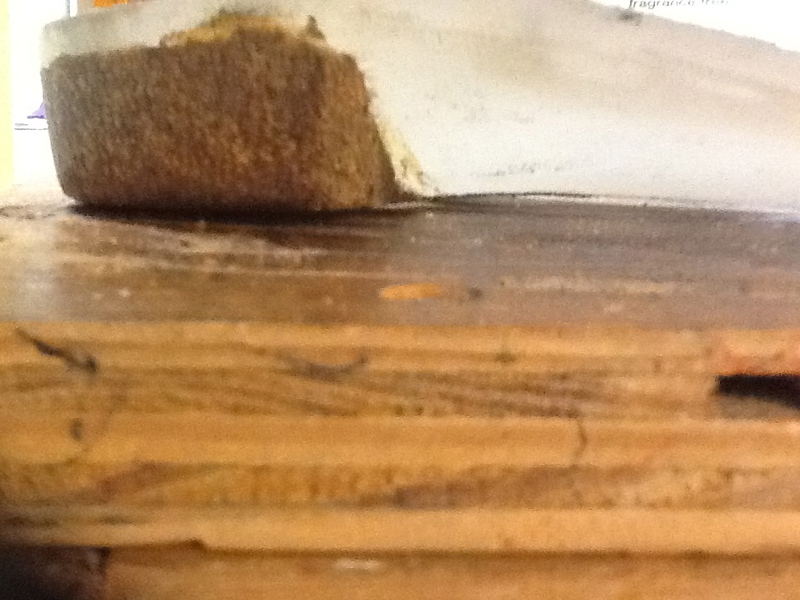 Extrinsic Rearfoot Post after years of wear and no longer stable against the ground. The entire post should be on the ground flush for maximal stability. Another view of how the worn down rear foot post is no longer stable and in full contact with the ground. The original post is removed. The surface is glued with Barge cement as is the surface of the birkocork. 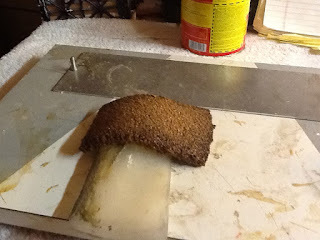 It is let to dry for 10 minutes. 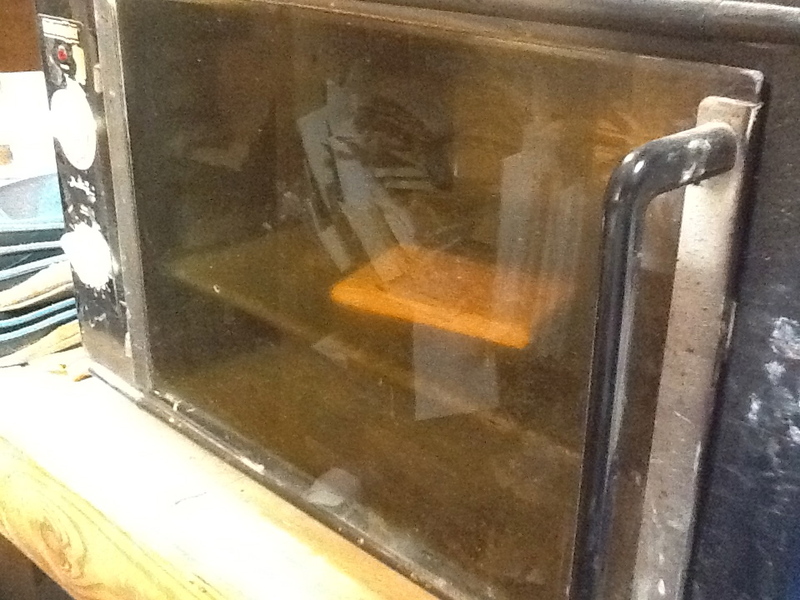 Then the birkocork is heated at 475 deg F for 5 plus minutes until the top starts to brown. 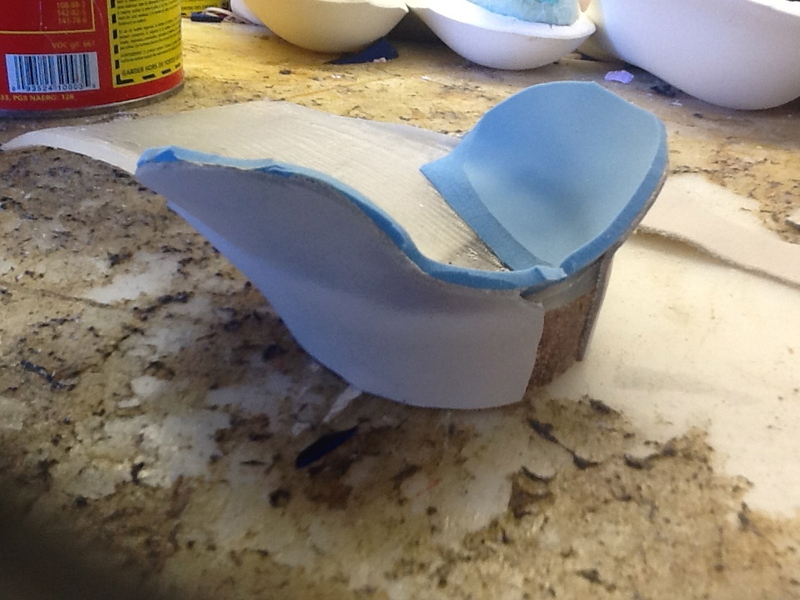 It is now laid on top of the heel area of the orthotic device. Utilizing a glued hand, the birkocork is molded to the shape of the heel cup. Then the birkocork is placed on the ground and the sides are pushed in to attempt a straight vertical wall around the heel cup. All excess will be ground later by a sander. 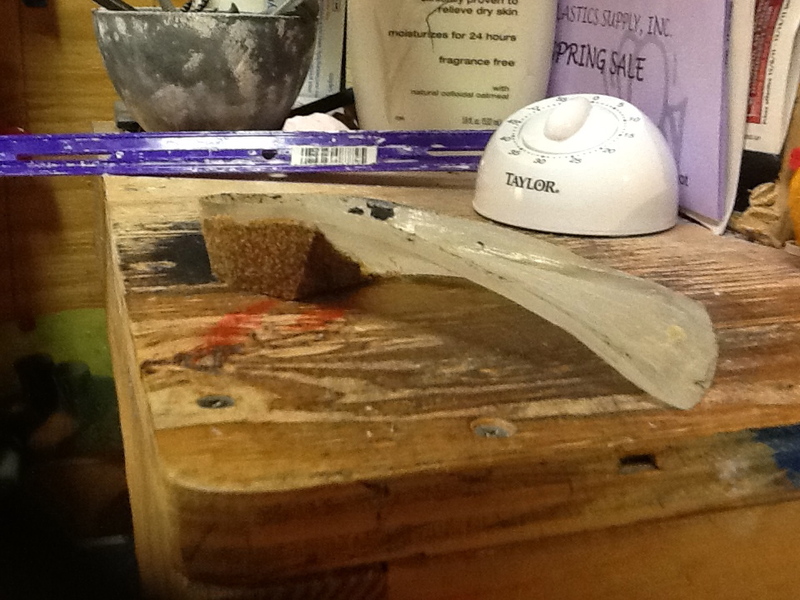 This demonstrates 2 rear posts with birkocork, one in its raw stage, and the other sanded. The bottom surface needs still to be sanded. This demonstrates the complete extrinsic rear foot post ground to be in full contact with the supporting surface at the same time that the leading edge of the orthotic is in full contact with the ground. 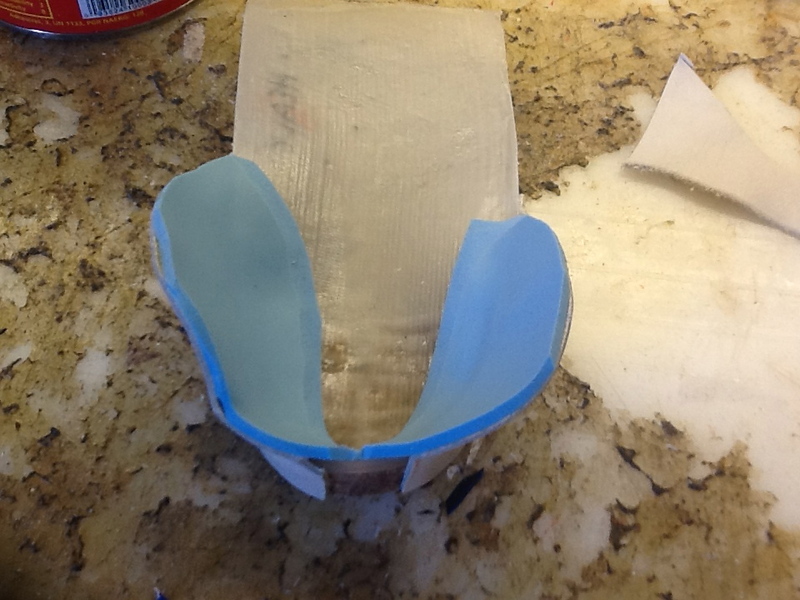 Another view of the rear foot post flush with the ground as is the front or leading edge of the orthotic device. This is very stable. 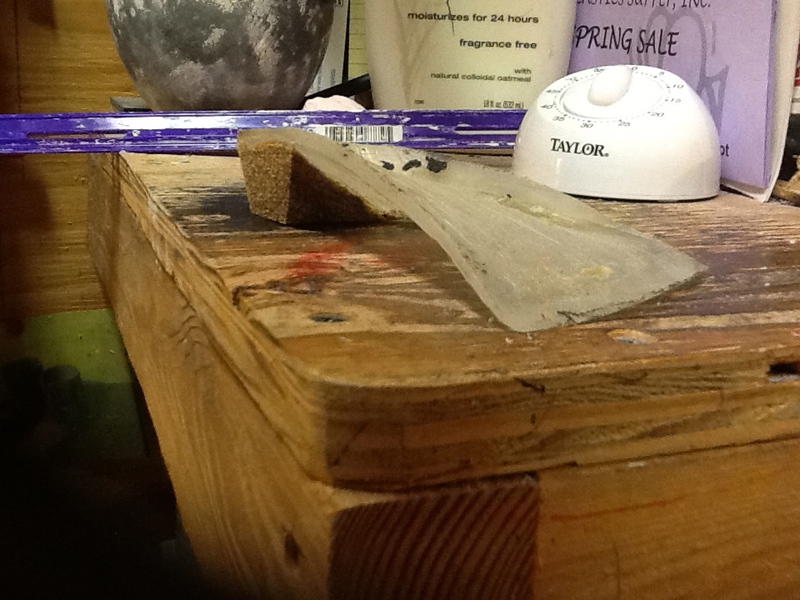 Another view of the complete sanded extrinsic rear foot post and a raw, not yet sanded, birkocork heel. Dry skin and callused heels are by far the most common foot complaints. These conditions make feet look older and less attractive, and they can pose a significant health risk. Dr. Glen Beede, a podiatrist in Fort Worth, Texas, says that dry, cracked heels can fissure, causing pain or even tissue wounds. Left untreated, calluses continue to grow thicker and, if they become infected, they may require antibiotics. But, with a little know-how and some due diligence, you can keep your feet healthy and looking great, no matter what your age. Beede recommends the Artemis Woman Heel Smoother (artemiswoman.com), a hand-held, battery-operated pedicure tool that has earned the APMA's Seal of Acceptance. The device features a DuraCrystal tip that easily exfoliates dead skin on the feet and smoothes calluses without the use of chemicals or dangerous blades. 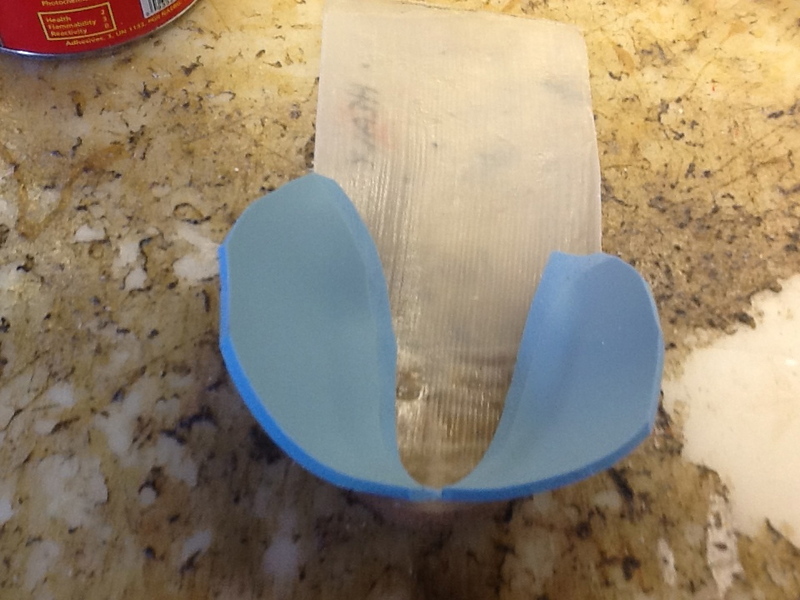 This simple trick has made many orthotic devices more stable over the years. Here I show a more complex version, but the general principle can be used just by adding a new top cover with medial and lateral wings. When the patient places their foot in the shoe, they must make sure the wings do not end up under their foot. They should be between your foot and the shoe. 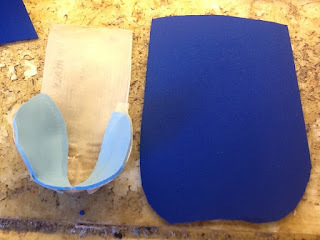 This trick can also be used with power lacing and simple tongue pads to greatly stabilize the foot and ankle for less pronation/supination tendencies. 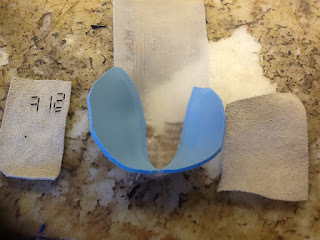 Here is a right orthotic device that I will add stability to by using 1/8th inch poron (JMS Plastics) to the medial and lateral sides of the heel cup area. This will increase the surface area to grab the foot from moving. Of course, for a severe supinator, this can be done only to the lateral side (baby toe side), and for a severe pronator, this can be done only on the medial side (arch side). 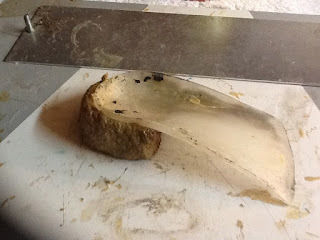 Here the poron has been glued and the poron has been skived along the edge of the plastic. The poron is now rounded to mold to the shoe easier. 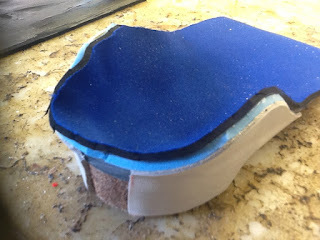 Leather is used to reinforce the outside of the flaps or wings as I like to call them to make it more sturdy. 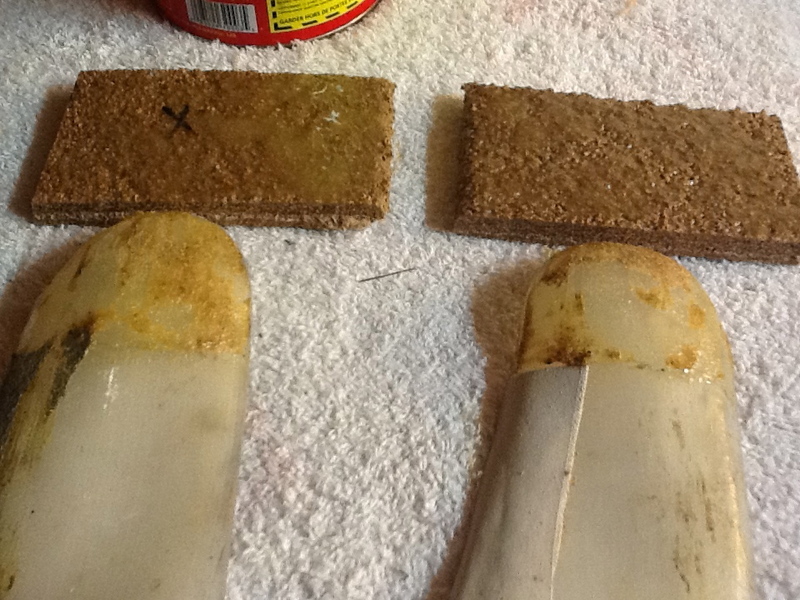 Here the leather reinforcement has been glued. 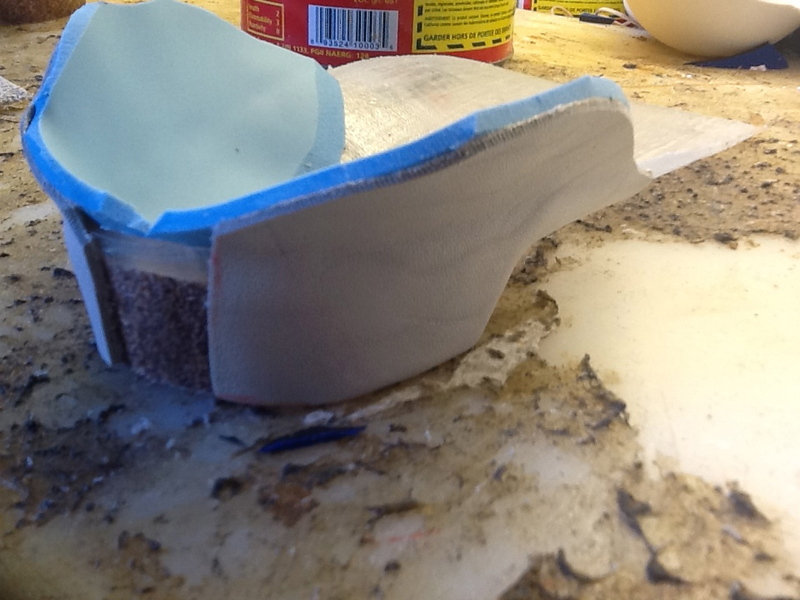 Here you can see the leather goes all the way down to the bottom of the rear foot extrinsic post. Here the leather has been trimmed. Side view of the wings created by the poron and leather. 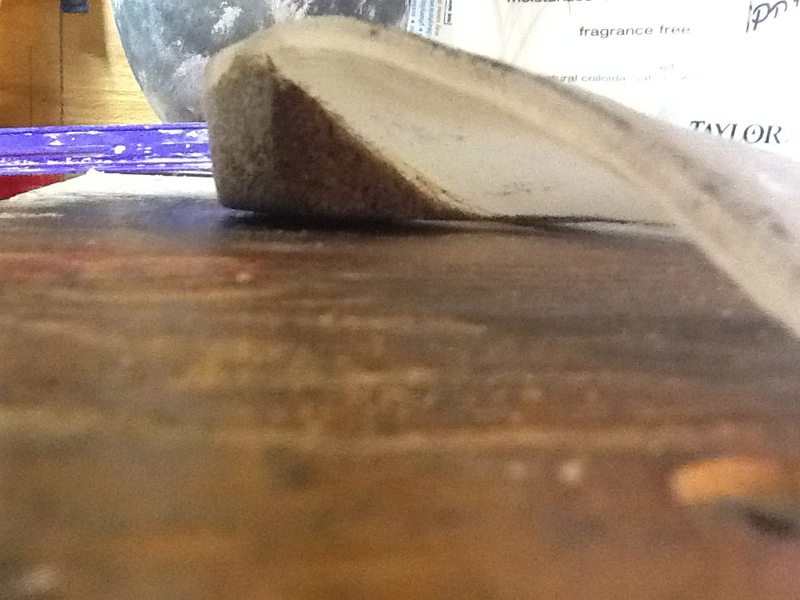 Any shoe repair store will have some scrapes of leather to use. Another view on how the poron has been skived or beveled. 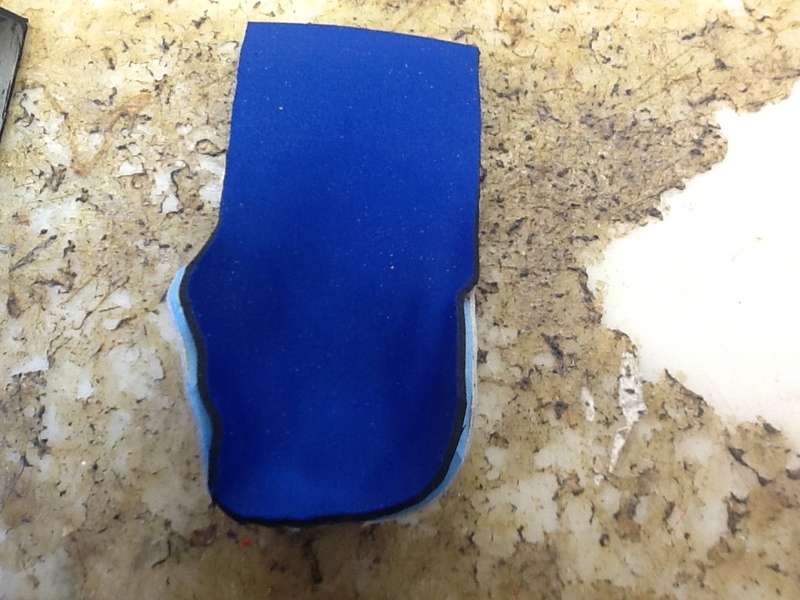 Here 1/8th inch neolon to cut to be the top cover of the orthotic (also purchased JMS Plastics). Top view of the final trimmed product. Closer view of the wings and top cover in place. 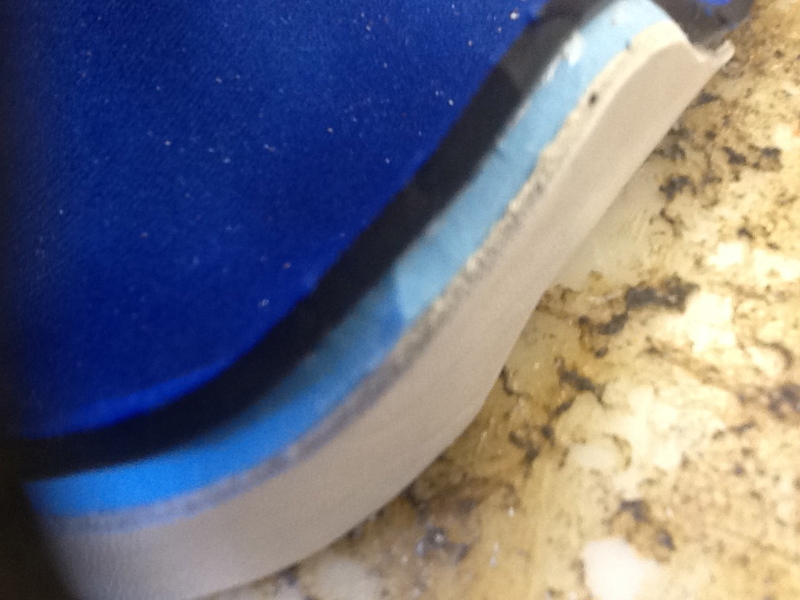 Close up view of the leather, poron, and neolon around one side of the heel cup. When giving cortisone shots near the skin, it is important to avoid long acting Cortisone which can weaken the skin and soft tissue for up to 9 months. Here a shot into the plantar fascia 2 months prior left some skin breakdown which will need some time to heal. Protective covering along with daily softening cream should be used until the skin becomes healthy again. Sent to me by my good friend Kenn. Thanks Kenn. DEFINITELY WORTH READING - The first tip is excellent. Have not tried the second. as if there is no rain. by giving him this idea.. WET OR ICY , along with the airbag warning. I love seeing the differences in people. I love seeing the great array of complexities patients bring into my office. And, at a deep level, I love to get a sense how various people sense the world around them. We are so different, yet so much the same. Our human nature pulls us together. Facebook wins because we all, at some level, feel lonely. We all crave for deeper meaning. One psychologist explained that we all search for the deeper meaning in life primarily in one of four ways: Through Truth, Through Oneness, Through Beauty, or Through Peace. This nature video will especially work on those of us who feel inspired with the beauty of nature. But, the rest of us will enjoy if we love the oneness of nature, or the peace imparted by nature, or the truths imparted by nature. Juvaderm: A Fat Pad Possible Replacement? The Jury is still out. When Diana Smirkle had painful corns which conservative treatment did not work, she turned to Dr. Johanna Youner in Manhattan for one of the latest techniques in foot pain relief. "It's an off-label use of filler that has been FDA-approved for areas on the face, the nose, and the labial folds for years, and we found it safe and effective in the feet," Dr. Youner says. The filler, Juvederm is injected beneath the corn and fills up surrounding tissue that has been lost through years of wear and tear. The filler not only evens out and shrinks the corn, it triggers the body to replace its own worn out tissue. "Using filler we can either delay surgery or halt it all together," Dr. Youner says. Bunions: What the top covers on your orthotics should not look like!! I am getting a lot of mileage out of these inserts for my blog since they tell a great story. 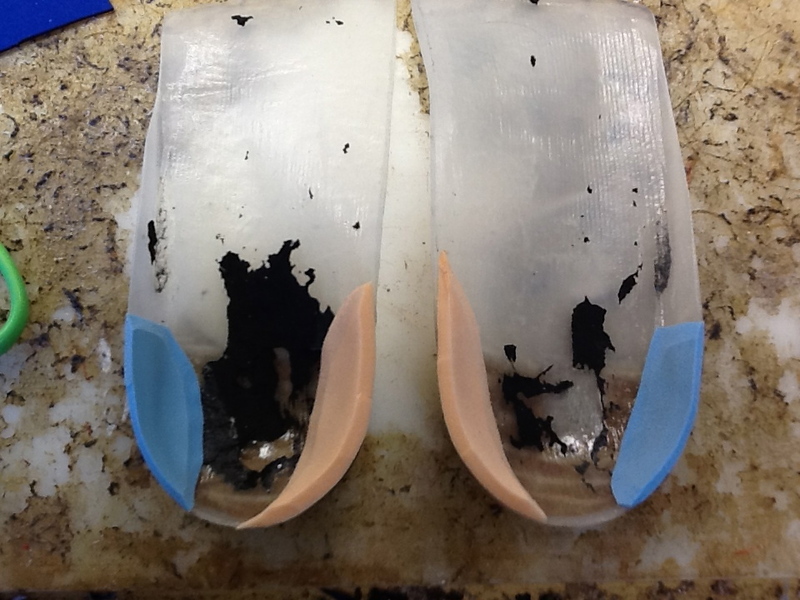 Orthotic devices are used all the time for long term preventative care of bunions. 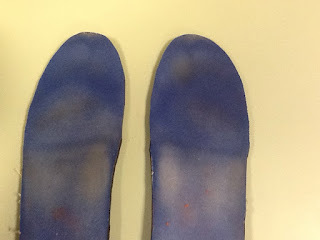 If you look at the wear pattern of these insoles recently removed from the top of a pair of orthotics for refurbishing, you will see that there is way too much pressure under the first metatarsal. 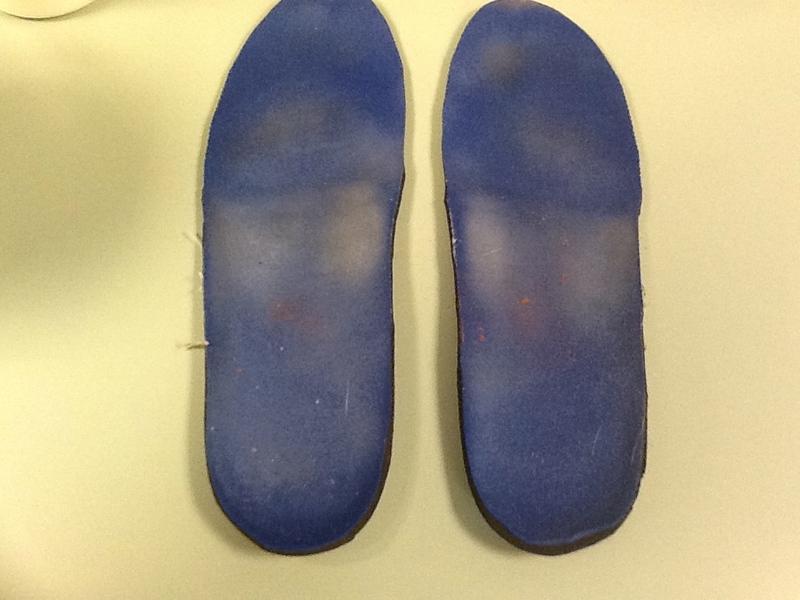 This pair of orthotics will not prevent bunions, they may speed up the formation of bunions. There is too much pressure under the first metatarsal which makes the bunion worse. 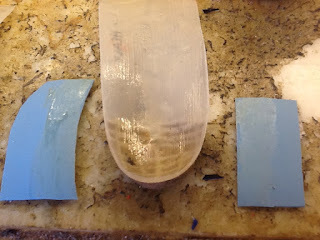 Golden Rule of Foot: If you are designing a pair of orthotic devices to slow down the development of bunions, you must shift the weight under the arch and into the center of the foot. We have to say that the majority of the weight on this pair is on the first metatarsal which is not good for bunion care. 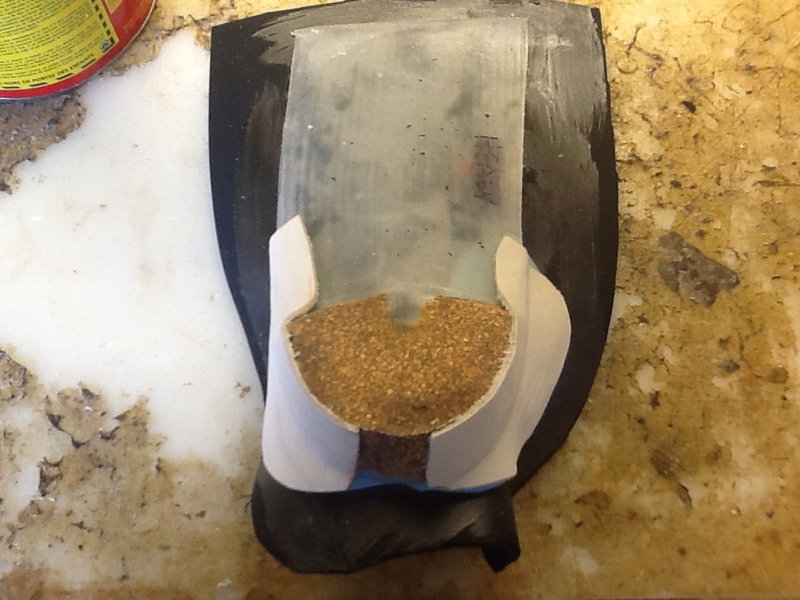 A redesign of the orthotics is in order. Also, this brings up the point of when to refurbish the orthotic devices. 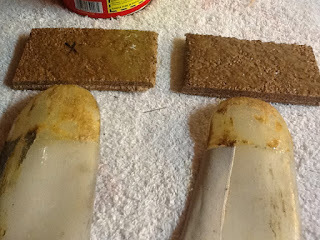 I believe that once a year ideally, the patient should relinquish their orthotics for several days for analysis of the wear pattern on the top covers and posts, and then for refurbishing. As a patient, you should make sure you tell the office that you want the doctor/therapist to look at the wear patterns, before refurbishing is done (normally by a technician). When We Push Off the Ground: What is the Ideal Wear Pattern? When we push off of the ground, the powerful first metatarsal should be free to plantar flex (move downward towards the ground) with most of the weight on the 2nd through 5th metatarsals (2nd the most). As push off continues (aka propulsion), the sign of great push off is strong wear under the hallux (big toe) itself. In the photo above, the right foot shows the typical signs of great push off (also called a propulsive gait pattern), and the left shows minimal to no active push off (confusingly called an apropulsive gait pattern). The right side shows dramatically more pressure under the first through third metatarsals seen in a good push off. Overall, however, the left side shows more mid foot and metatarsal area pressure, so that side is bearing more weight. These top covers were put on at the same time, and are only used for walking. The patient does a lot of walking each day. For those biomechanical afficianodos, this patient has forefoot varus with a Root Balanced Technique. I do not like the first metatarsal pressure on both sides, and would personally convert the orthotic to a Kirby skive with first ray cutout or the Inverted Orthotic Technique. 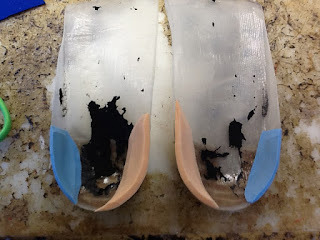 The science of reading shoe inserts for pressure analysis can be as mysterious as reading the tea leaves for some, but not for experienced forensic podiatrists like myself. When this patient stated she was having heel pain, and found great relief from some orthotic devices she only wore occasionally, the wear pattern on the top covers shows the whole story. This may be a fitting blog post for the day the new Sherlock Holmes movie comes out. Can you see where the wear is? Probably more important, can you see the heels have had excellent pressure relief? Elementary my dear Watson!! 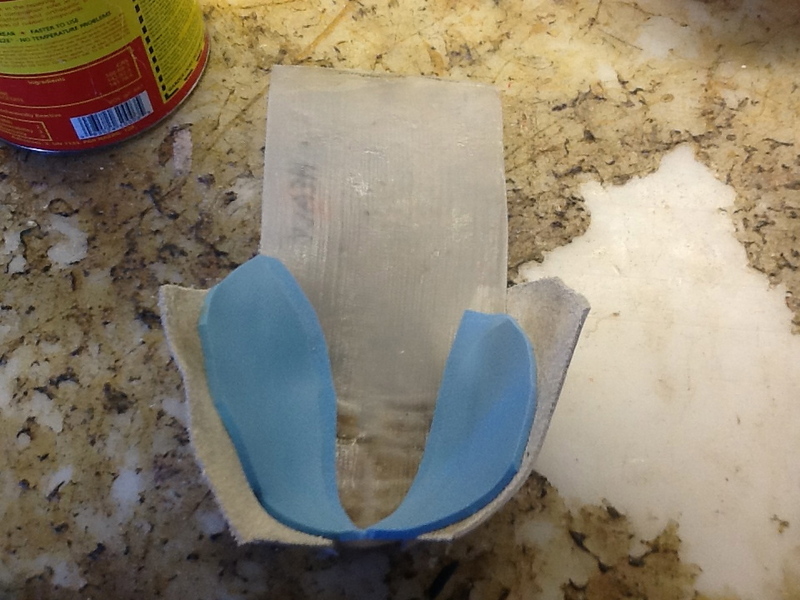 Here various materials are used along the medial and lateral borders of the heel cup to obtain getter stability out of an orthotic device. Here my patient John, his name has been changed to protect his identity (witness protection), demonstrates why his toenails need to be registered as a lethal weapon. I, Rich Michael Westin Blake, must protect his identity (but also prevent his significant other from massive trauma). It is the duty for my country and humanity. Good News: Almost a Oxymoron--Check this website and Feel Happier!! Oh by the way, did I tell you the story of the paralyzed cyclist who is now trying for the Olympics!! Cold Feet: Where to Start. Hi my friend! I'm making some progress on the foot with an accupuncturist. It's slow going but a little less painful. I'm writing for another reason though...my Mom has been suffering with some weird symptoms in her feet and, although she's seen every doctor imaginable, she hasn't gotten any relief. I thought I would ask my favorite podiatrist! Her symptoms are that her feet feel frozen 99% of the time. The ONLY time they are warm is when she is barefoot and drinking wine which, although that sounds like fun, can't be all the time. She believes it is circulatory but has seen a specialist and they can't find anything wrong. She is at her wits end and doesn't know where else to turn. Any thoughts? I would appreciate any advice. I hope you are well and that your holidays are outstanding. Wine--alcohol is always a vasodilator (increases the blood flow). Barefoot--normally means that there is no compression on the arteries from socks or shoes. I would have her experiment with elevation vs dependency, short socks vs long socks, warm water soaks, niacin tablets, 8 oz glass of quinine water, Toastie Toes from REI or Amazon, Infracare Socks, Contrast bathing. As the results turn up, you find the answers to the riddle. Great Sherlock are we!! If she lives near me, I expect an invite for a glass of wine for the advice. Only partially teasing!! Dr. Phil Vasyli, a podiatrist and founder of Orthaheel and Vionic Performance Footwear, notes that a 15 minute bout of exercise each day can increase your life expectancy by three years, even if you have cardiovascular disease risk factors. Daily physical activity is especially important for older adults, because maintaining an active lifestyle into the senior years has been shown to reduce blood pressure, inflammation, blood sugar and other markers of chronic disease. Exercise can also boost immunity. Additionally, getting outdoors and exposed to some natural sunlight at any point in the day can help regulate the body’s production of melatonin, a hormone that controls the sleep cycle, says Dr. Vasyli. Foot Stress Fractures: Why do they occur?